Hinton, Aug. 28 - Funeral services for John F. Hoke, 31, of Meadow Creek, were conducted at 2:30 o'clock this afternoon at the Meadow Creek Baptist Church by Rev. Fred Dillon, assisted by the Rev. Clair Burkett. Burial to follow in the Meadow Creek Cemetery. 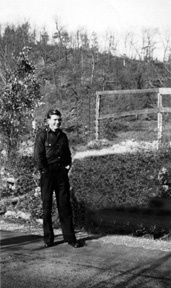 Hoke was an electrical engineer employed by the Rogers Brothers Circus and suffered burns when a fire destroyed the circus generating plant at Maysville, Ky., on Aug 12. The following obituary was taken from the Hinton Daily News date, saturday, August 26, 1950. John F. Hoke, 31, of Meadow Creek, died yesterday afternoon in Maysville, Ky., from burns sustained in a Aug. 12 circus fire there. Mr. Hoke had been with Rogers Brothers Circus only a short time, having joined them when they were in Hinton in early july. He was born in Meadow Creek, Jan. 3, 1919. 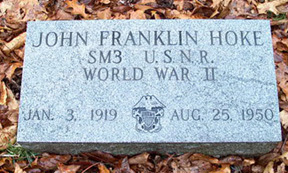 During four years of World War II, he was in the U.S. Navy. Critically injured in a $35,000 circus fire in Maysville, Hoke had rallied after the Red Cross flew in blood plasma. He had received first, second, and third degree burns. Seconds after the explosion in the gas diesel generating plant, Hoke appeared at the door of the trailer, which housed the plant, his body enveloped in flames. As he fell out of the door, workers rolled his body into a blanket. He was an electrical engineer for Rogers. Hoke is survived by his mother, Mrs. Bessie Hoke, of Meadow Creek; four sisters, Mrs. William (Bessie) Bleau, Mrs. Roy (Beatrice) Jones, Mrs. Elmer (Nettie) Richmond, and Mrs. Charles (Josephine) Richmond, all of Meadow Creek; and a half brother , Earl Hoke of Montcoal, W. Va. The body is being returned to the Ronald Meadows Funeral parlors today. Funeral arrangements are incomplete, but services will probably be Monday afternoon, the family said.